The Melbourne Vixens welcome two new faces to the squad with Rudi Ellis and Allie Smith joining Lara Dunkley, Rahni Samason and Jacqui Newton as Vixens training partners for the 2019 season. No strangers to the Netball Victoria high-performance programs, Ellis and Smith were a part of the Victorian Fury team in 2018 and have played in the Bupa Victorian Netball League for the last three and five years, respectively. Ellis and Smith join Dunkley, Rahni and Newton who were Vixens training partners in 2018 with midcourter Tayla Honey who has been elevated to the team. Vixens head coach Simone McKinnis congratulated the five athletes on their selection. “We’re really pleased to announce these 5 athletes who will join the squad for 2019,” said McKinnis. “Rahni, Lara and Jacqui have already been exposed to the Vixens environment this year and have really embraced what the team is about, while we welcome Rudi and Allie who have impressed us not only on the court but also in their dedication to their own development, which allows them to be a great fit for the Vixens environment. Rahni Samason has been rewarded for her breakthrough 2018 season, re-signing for her second year as a Melbourne Vixens training partner. The young goaler dominated the 2018 Deakin University Australian Netball League (ANL), scoring 524 goals for the year to be named ANL MVP and Victorian Fury MVP. After her first year as a Vixens training partner, midcourter Lara Dunkley returns to the Vixens environment again in 2019. Flourishing in her role as captain of the Victorian Fury in 2018, Dunkley's leadership from the centre is apparent every time she takes the court. Defender Jacqui Newton returns as a Vixens training partner in 2019. Newton gained a wealth of experience in her first year as a training partner, being brought into the Vixens team as a replacement player for the injured Emily Mannix. Allie Smith is a talented Geelong netballer who has progress through the Netball Victoria pathway. Recently re-selected to the Victorian 19/U state team, this young defender has already made a name for herself in the sport - including selection in the Australian 19/U squad, a VNL Division 1 premiership with the Geelong Cougars in 2017 and being a pivotal member of the Victorian Fury in 2018. Rudi Ellis came to Victoria after a year as a training partner with the NSW Swifts. Her defensive and athletic ability quickly impressed, seeing her invited to Vixens training throughout the season. Ellis was also selected in the Australian Netball Development Squad, joining the likes of other Suncorp Super Netball players. 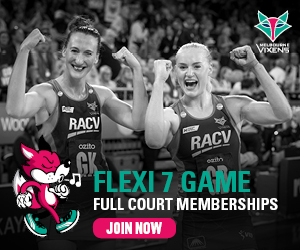 Melbourne Vixens memberships are on sale now. Visit our Membership Packages page for more details.